These post-Christmas days are a bit less hectic (but hey, just a tad) than what I’m used to survive to normally, so I’m having some good old hacking fun (you know, the kind of stuff you don’t know how much you’ve been missing until you return to it). Maven2 is really, really nice. I’m still reluctant to say that it rocks since I need to see how it behaves with complex stuff, but so far it has way exceeded my expectations. After a few years spent juggling megabytes of jars even for the simplest stuff, seeing that my (automagic, just mvn assembly:assembly) distribution of what I’ve got so far is *just* 4K despite having 15 different library dependancies makes me so happy that I might break in tears any moment now. E4X looks terrific. It’s so immensely powerful to sparkle a lot of weird ideas in mind to exploit every single bit of it in my quest to reduce XML-induced overtyping and messy stuff. Now, if only I could convince Rhino to use my (Java) DOM trees directly in E4X instead than having to go through string serialization every time (yuck!) I’d be a very, very, happy puppy (suggestions are welcome, of course). JSON is another neat piece of technology worth visiting. A suggestion from Sylvain revealed how my quest for a comfy pipeline API might be soon over if I manage to bend it a little bit to my needs, but so far looks promising indeed. I’m almost positive work stuff will make me drawn any moment now, so that I’ll be forced to quit these nice experiments, but I definitely want to pursue the above technologies, see if and how they might help in the OSS stuff I’m involved in and, last but not least, bring them to our projects where it makes sense. Moreover, as my formal new year proposition, I want to commit myself to some hacking on a regular basis: yes, old lawyers farts can code! I played a little bit with E4X in Cocoon some time ago. E4X in Rhino uses XMLBeans as internal XML model. One of the goals with XMLBeans was better DOM integration, with DOM – XmlObject adaptors. IIUC, o.a.xmlbeans.XmlBeans.nodeToXml(Node), should do the job. Hopefully it is an adaptor rather than a copy, which would make it really atractive for use in flowscripts in Cocoon. Haven’t tried though. 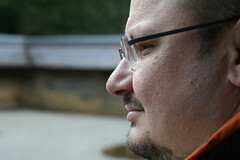 I'm Gianugo Rabellino, Open Source enthusiast, passionate golfer, foodie and geek at heart. I'm the Senior Director, Open Source Communities, at Microsoft, a member of the Apache Software Foundation and a guy who's been paying his bills with Open Source for more than 18 years now. Did I mention I'm a lawyer?